The holiday destinations I dream about - and those we eventually travel to - are usually natural wonders of some kind. However, the more I become a "city photographer" the more I also fancy buildings along our travel route as photography subjects. This past summer we traveled through several National Parks and coastal regions of the northwestern USA. Already long before our trip I had identified a handful of man-made landmarks that I was curious to photograph a little more creatively than just with a quick snap while passing by. 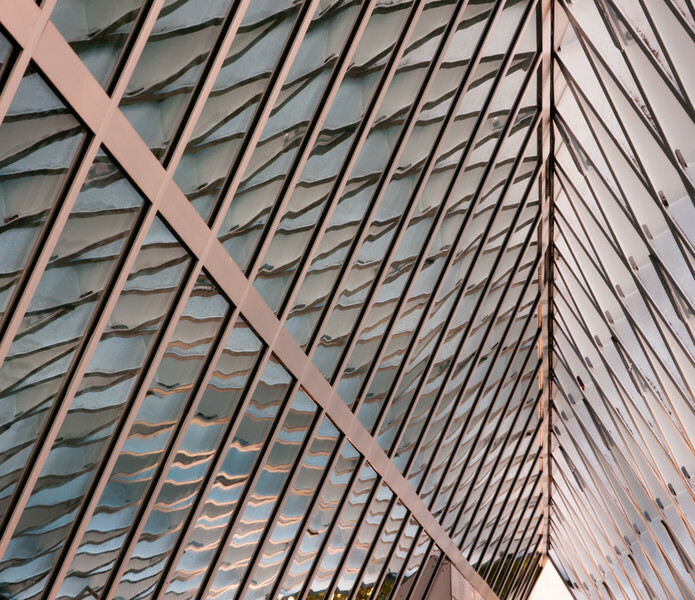 At the top of my short list was the Seattle Central Library building, which was designed by Rem Koolhaas. What a fantastic building! 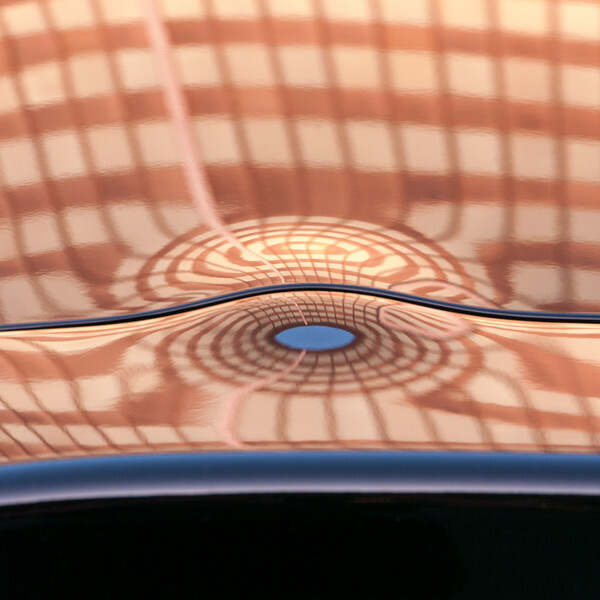 Its most recognized by its particular shape and glass facade, but I found the inside even more interesting. Since it is a public library everybody can enter and even photograph the interior, which is not possible in many other "cool" buildings. 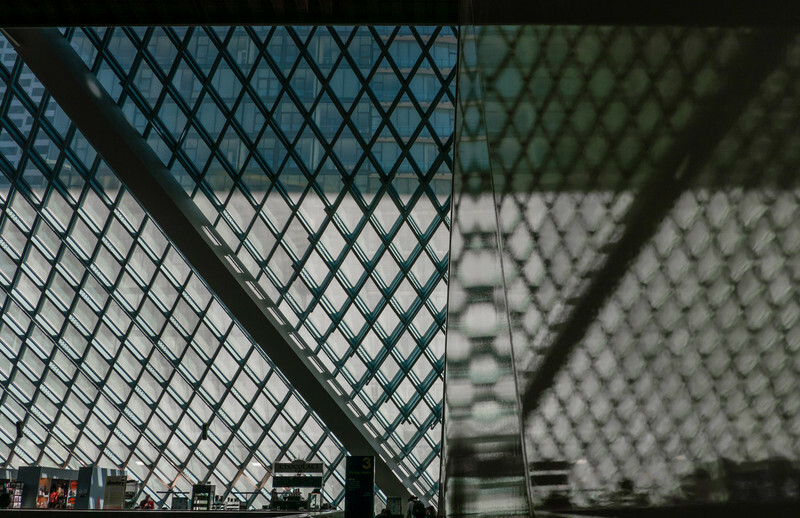 I spent about an hour trying to find unexpected views, reflections and viewpoints inside the Seattle Central Library. 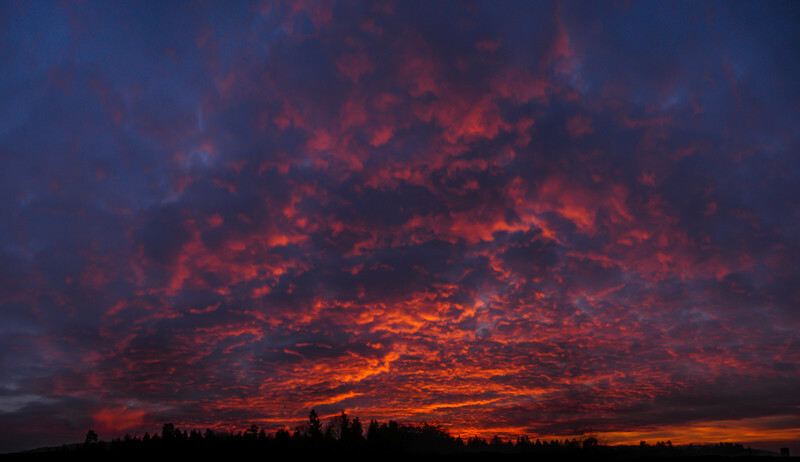 The four photographs below are the compositions I am most satisfied with. I thank you for your visit and hope you enjoy! Triangles near the fifth avenue entrance on level 3. 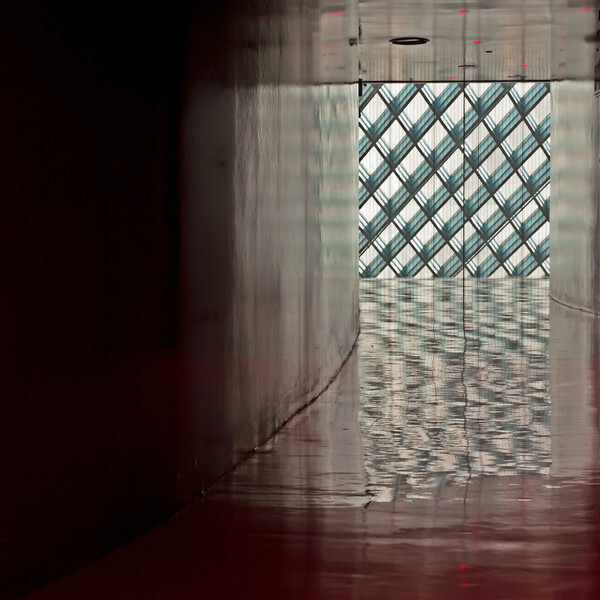 The red floor on level 4 offers glimpses of the glass front. In the "living room" on level 3. 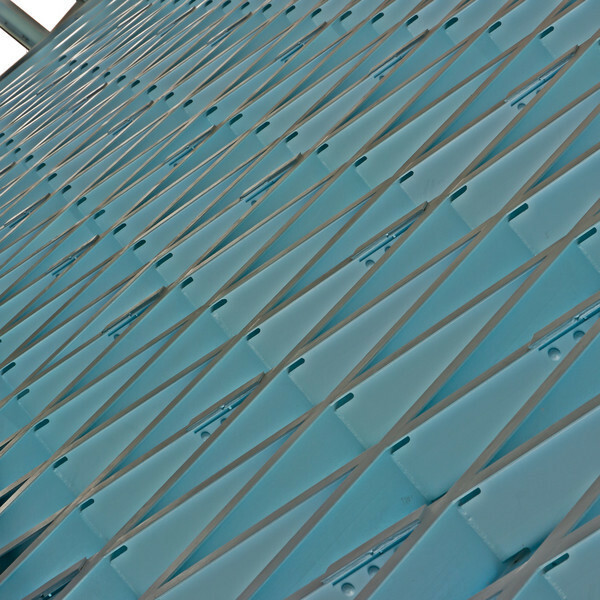 An interior facade from the highest public viewpoint in the Seattle Central Library (on level 10). As in the last nearby blog post, I am showing you a view of the Swiss Federal Institute of Aquatic Science and Technology (EAWAG). The Forum Chriesbach building resembles the PWC building shown in earlier posts. 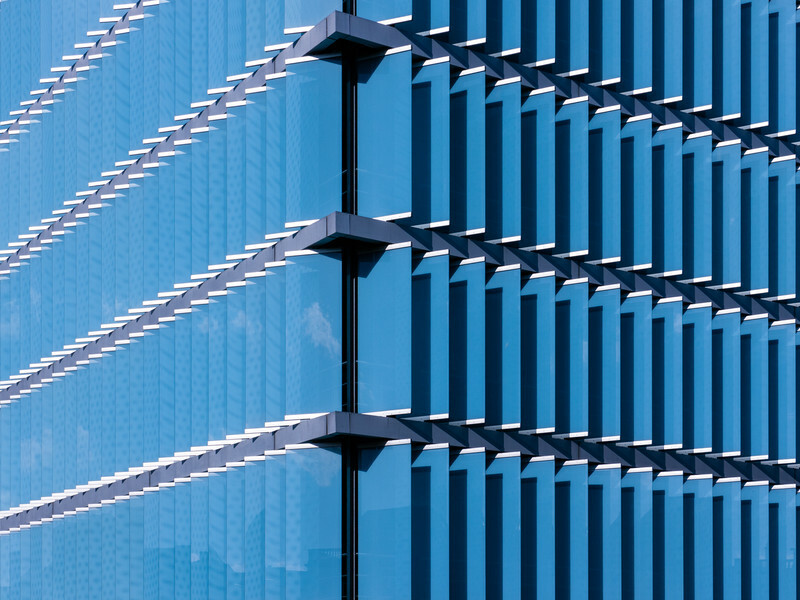 The mobile glass panes of this building are blue instead of grey, but the perforated imprint on these panes also creates a fascinating moiré pattern (as shown here on the PWC building). The photograph is part of the facades gallery. An egg laying wooly milk pig is the german equivalent of a jack of all trades device. It is the fabulous creature that does everything as perfectly as anyone could ever wish. But, as I am sure (almost) everybody knows, such mythical creatures do not exist. Only Camera and Lens Review (do you remember them?) do not seem to be aware of this important little fact. Camera Review thinks that the jack of all trades device does exist and for example criticizes cows that fail to lay eggs or give bad wool. Even more disadvantageous is the blind loyalty to Camera Review by the majority of customers. Why on earth do people care about eggs if all they want is a glass of milk? Unfortunately, the farming industry has submitted to the dictatorship of Camera Review by and large and really tries to create the impossible. Of course, all they come up with are unsatisfactory compromises whose eggs are ridiculous in comparison to a proper chicken (or even duck) egg, whose wool is only a shabby imitation of a sheep's product, or whose milk not even remotely resembles the richness of real milk. But a tiny egg, a shabby fur or watery milk is better than nothing and prevents criticism for a major omission, which seems to be the most feared form of critique of all. We may actually already have the milk cow that lays perfect eggs, but we do not realize it because Camera Review thinks it should definitely also have a sheepskin and provide us with a juicy ham. I am of course not writing about genetically modified livestock, but about cameras. A camera with more functions is not automatically a better camera. Take an inbuilt flash as an example. If a manufacturer omits this useless feature, the camera will be criticized for this lack, receive less points in questionable camera comparisons, and be less sold (I assume this is the reasoning of camera manufacturers). Of course, if a flash is included it will be criticized for being weak, small, of short reach, at the wrong location etc. For most people it would be much better if their camera did not have a flash included, not only to prevent flashing while they photograph the Golden Gate Bridge from 300 m afar during daytime, but also because their cameras would have less buttons, simpler operation, longer battery life and a smaller housing. 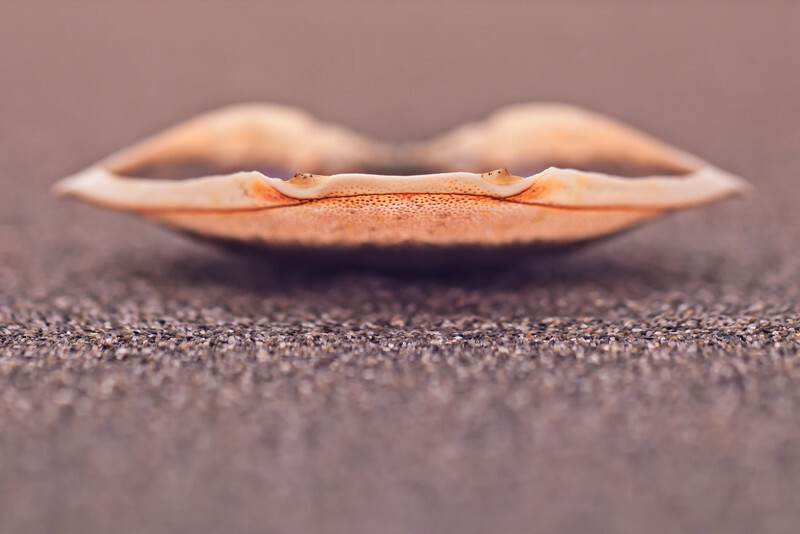 There are many other camera functions that are included for the very same reasons - only to provide as little contact surface for Camera Review as possible, not because they are really needed. I would really wish there were more manufacturers that design cameras with more courage to omit (unneeded) features! 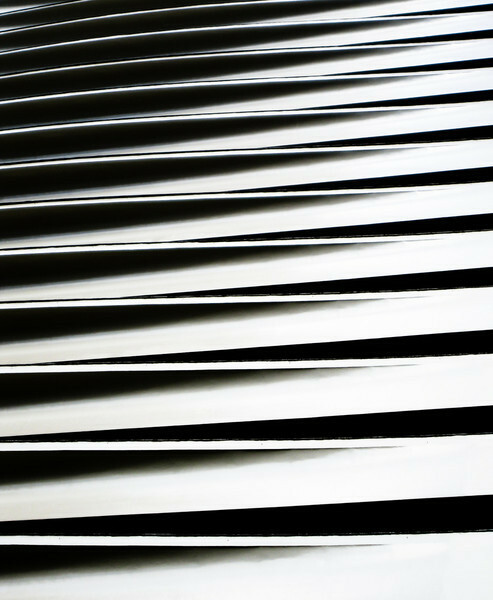 Omitting a function may be a quality, not a lack! P.S. Before publishing this text, but after I had started writing it, a wooly pig and an egg laying cow were announced: The Sony A7 and A7r. Note: Neither of the two cameras has an inbuilt flash! A light & shadow composition on a facade in Hong Kong - also taken with a tiny point-and-shoot camera. The Swiss Federal Institute of Aquatic Science and Technology, abbreviated EAWAG, comprises several locations in Switzerland. Close to Zurich, whithin biking distance of my home, lies the EAWAG station in Dübendorf. The building called Forum Chriesbach is an exemplar for energy efficient design and a photography subjects that I have visited several times already. 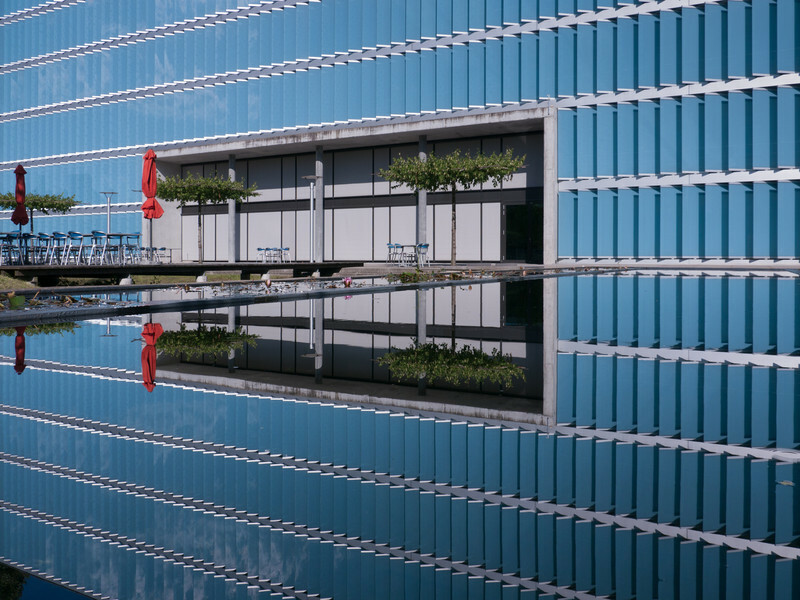 The blue glass panes that follow the movement of the sun resemble the PWC building, but the color, surrounding and overall architecture of the two buildings are rather different. This nearby composition is part of my man-made reflections gallery. 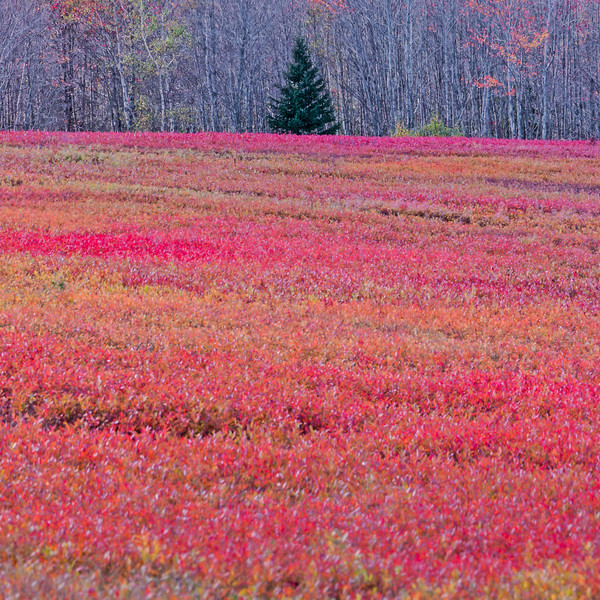 Autumnal blueberry field and fir tree, Maine, USA. I have printed this photograph in September as the starting signal for my monthly print project. From now on, I try to print at least one photograph every month. If you want, you can suggest which one and even receive a free print in exchange! I found the photograph above very difficult to print. I have tried many times and even sent it to a commercial print service, but I am quite satisfied with this latest version (of course, it looks different on paper). Photographs are taken to be looked at. As a teenager I was using slide film and always waited for a sale to have a couple of posters made. However, having prints made was often disappointing and the result not quite as I envisioned. In contrast, printing myself gives me almost complete control over the final result. I have started to print scanned slides even before I had a digital camera and now my printing interest has reawakened and strengthened. In order to print more regularly, I have decided to print at least one photograph per month (in highly limited series). If I manage to stick to this plan, I will create at least 12 prints per year - a good minimal number, I think. I have already created my September print (the autumnal blueberry field shown above) and chosen the photograph to be printed in October. However, if you want, YOU can choose the future monthly prints and receive a copy free of charge! The rules for obtaining a free print (unmatted, unframed) are very simple. As soon as a new month starts, you are invited to ask for any photograph that you find on Florian's Photos to be printed the next month. If you are the first person to ask for a print in any month, the photograph you have chosen will be printed the next month and you will receive a free print. You may only choose photographs that have not been printed yet (all printed photographs will appear on a separate page) and each month only one photograph can be chosen and received free of charge (I may choose and print additional ones). Also please note that I will only send one free print to a particular person/address ever. I look forward to my printing endeavor and to fulfilling some of your print request, if you should have one. To ask for a print, please use the contact form on Florian's Photos or the reply section of this blog post.